The Barham and District Horticultural Society, centered around the village of Barham in Kent is a friendly, active, local society which promotes and stimulates interest in all aspects of gardening - from growing vegetables, flowers, shrubs and trees to the quiet enjoyment of gardens and their wildlife. The Society was founded in 1895 and has over 200 members drawn from a wide area including surrounding villages - from enthusiastic active gardeners to those with a less active interest in gardens who often just wish to enjoy participating in the society's events and activities. 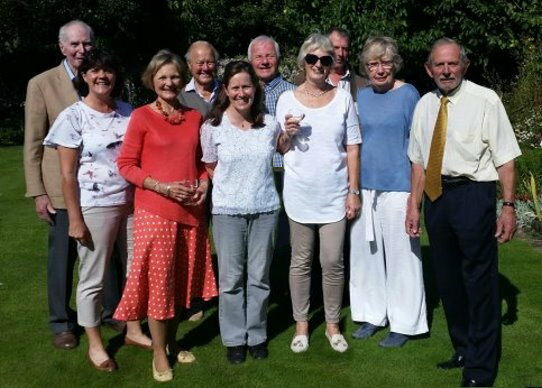 Activities take place throughout the year including group outings to well known gardens, talks in Kingston or Barham Village Halls, plant sales and swaps and two annual shows. The Summer Show (July) together with the Autumn Show (September), are the highlights of the Society's year giving members and non-members a chance to display their own grown fruit, vegetables and flowers together with classes for floral art, cookery, photography and additional classes for young people. Outings are another key feature of the Society's year – previous years have included coach trips to the Royal Horticultural Society's Wisley garden and to Le Bois de Moutiers in France. The society also provides members with the opportunity for bulk buying of heavy items such as gro-bags, compost and other gardening products which are delivered to your door. We also run an annual discount seed purchasing programme. The Horticultural Society is run by a committee drawn from the wide village membership and appointed by members at an AGM. If you would like to become a member or would like further information please contact any member of the committee, or come to a future event and meet us. We welcome new members - you don't have to be a skilled gardener, younger or older, just interested in some aspect of gardening. To join simply complete the online entry form with your contact details and what class of membership (individual or family) you would like and either the Chairman (Tim Bines) or the Hon. Secretary will be in touch with you to provide you with your membership card and other information (as well as seeking you subscription!). Annual membership is £5 for an individual or £10 for a family. Contact us online with any questions you might have. The Regulation, extending the Data Protection Act, came into effect on 25 May 2018 and requires all organisations holding data to comply with its provisions. The Society is required to produce a Data Protection Policy and to notify members of the data held and any use to which it is put.